Camera shy Matt Bannister poses after a second win this season. The demanding Cadwell Park track proved ideal for the quick 240Zs, with Charles Barter qualifying on pole with Matt only a few tenths adrift alongside. At the start, Matt held station with Charles through the first left-hander to gain the inside line advantage at the second. Charles fought back with passion, but eventually over-cooked it in an overtaking attempt at a point where Matt was already 110% committed. Charles dropped back significantly, eventually recovering to seventh place. Matt didn't have it all his own way from there on, having to fend off a pack of squabbling Lotuses led by Rory Stockbridge (Europa) who finished second overall. Charles' son, Julian, was second in Class B in his TVR 3000M, followed by Tony Ellis in a Mazda RX7 and Dad in fourth place in class. Paul Stafford in the third 240Z finished tenth overall and fifth in class. 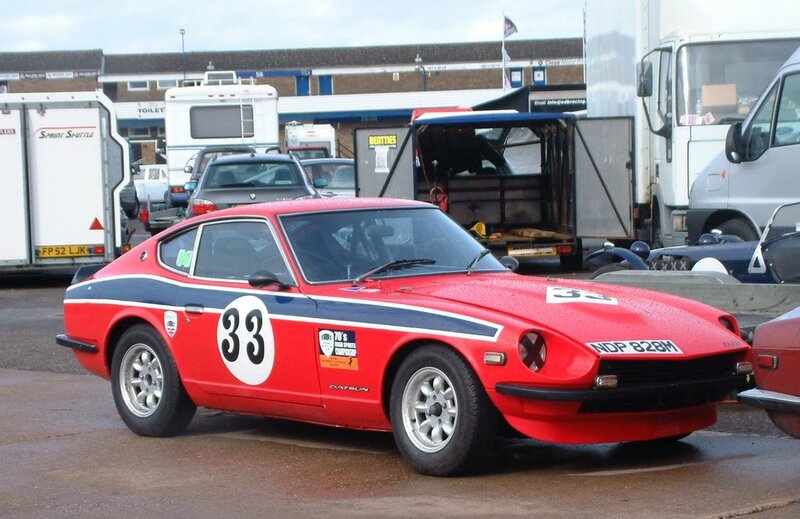 Next outing for Round 3 is at Brands Hatch on Sunday 7th May - this will also be the May meeting for the SEKZ Group, so look out for all models of Z in the car park. Early birds may get one-make parking on South Bank - look out for a gathering of Zs at the entrance and tag along. 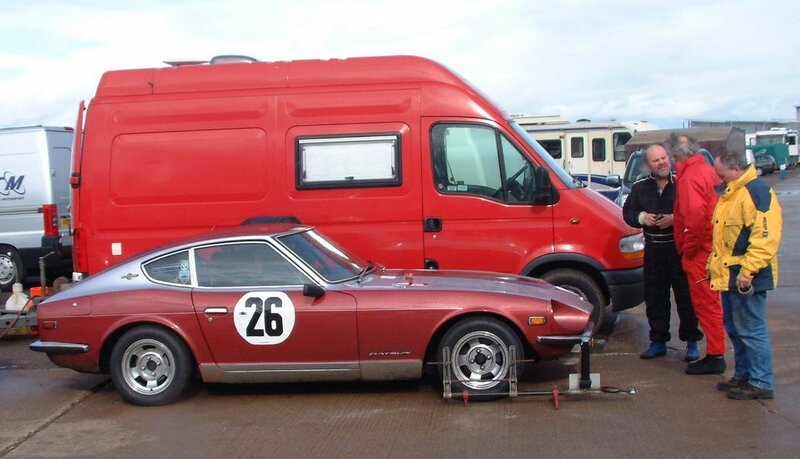 Come and meet the drivers in the pits and get to know the cars at first-hand. Matt Bannister is sponsored by MJP (Eastern Auto), the winning team. Other sponsors include D.J. 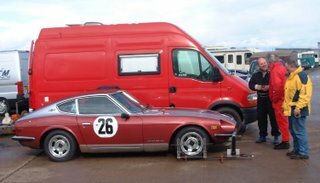 Road & Race Services, Jet Wheel & Tyre and A & L Services. Congratulations to Matt Bannister on a fine win in the wet! At the first round of '70s Roadsports for 2006, the SEKZ's very own Matt Bannister won in fine style. 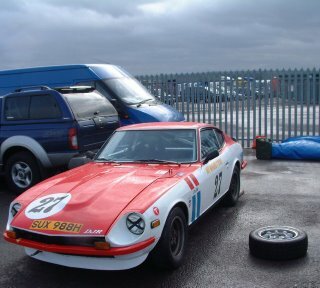 Qualifying in damp conditions on the front row of the grid, the 240Z was producing consistent 1:26s. Keeping a wary eye on the weather was the order of the afternoon - the rain clouds were rolling in interspersed with patches of sun. In the end Matt went out on normal dry tyres, a decision shared by the majority of the field. At the start, lined up alongside Richard Thorne in the big Morgan V8 and with Julian Barter (TVR) and Rory Stockbridge (Lotus Europa) looking for the gaps to squeeze through. Matt made the perfect start, easing away from the Morgan progressively into Redgate. He lead the race from there in a beautifully controlled fashion despite worsening conditions. A mid race challenge from Julian and Rory was handled with a new maturity and Julian later spun off while pushing the car too hard to keep up. Stockbridge finished a creditable second in his first outing with the Lotus and Barter recovered to seventh, fighting through the midfield contenderd! 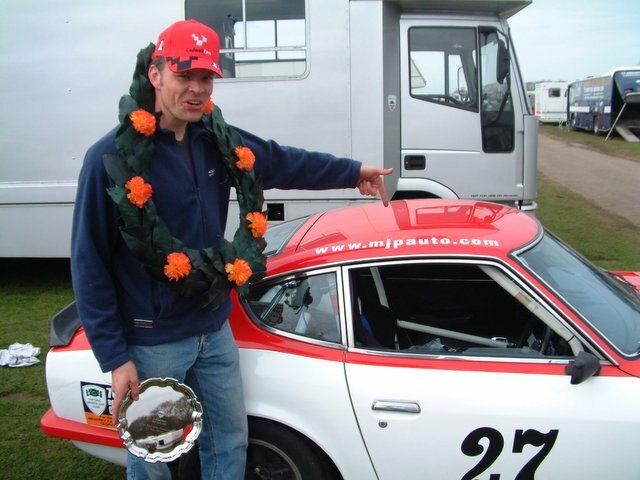 The other 240Zs of Clive Foskett and Paul Stafford finished 13th and 14th respectively (4th and 5th in Class B).